Not me, there’s not that much planning involved. Of course, it had been boiling in my mind to MAKE one–it’s hot, and nobody wants to bake. We’re barely cooking. 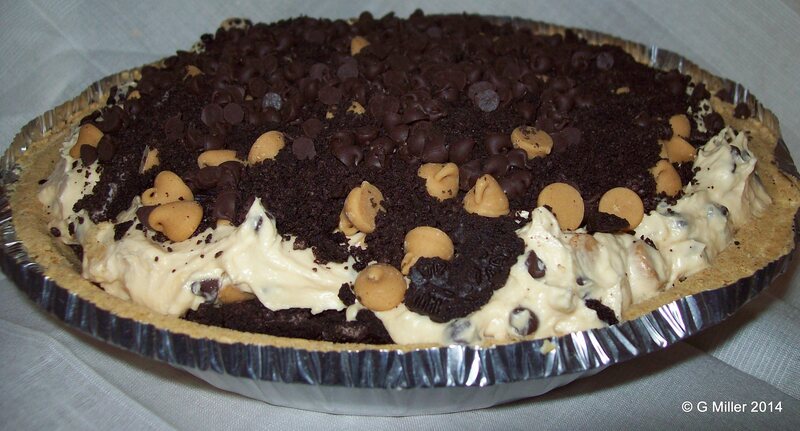 Besides the normal pantry sort of things (peanut butter and milk in this case) I did have a graham cracker crust, mini-chocolate chips, peanut butter chips, some instant cheesecake flavored pudding, some knock-off brand Oreos, and an 8 oz. package of cream cheese. I’ve had a craving for peanut butter and chocolate lately, but often, the chocolate is overbearing or else it is absent entirely from the flavor combo. The chocolate cookies…along with tiny chocolate chips, oh yeah. Now I have a faintly tan almost-smooth stuff in my bowl, and added a cup of milk. I should have thought that bit out further. The bowl wasn’t quite big enough to contain the splashing, so adding it slowly MIGHT be a really good idea if you don’t have a really deep bowl to beat it in. I ended up spattered, along with half an acre of kitchen, including dishes that had just been washed. I really resented THAT part. Washing dishes is hard work! Okay, now I have a sloppy but not very creamy mess in my bowl, it must be time to add the instant pudding, right? But first…make sure your cookies are crumbled. I massacred 8 Oreos into a fine crumb in the blender. I also got out the peanut butter chips and the mini-chips. You’ll need about a half cup of each to stir into half of the filling later, and since the stuff gets stiff fast, having them ready is a really good idea. Okay, so NOW you can get your pudding mix out, dump it in and beat the mixture. Stop and scrape the bowl after about 30 seconds, piling it all in the center. At this point, you are trying to ensure its somewhat smooth and creamy. Beat the mixture on high for about 1 minute. Pour half of the filling into the bottom of the graham cracker crust. Spread it out, and dump the crumbled cookies onto that layer and spread THOSE out. Add your chocolate chips and peanut butter chips, stirring to blend them evenly. 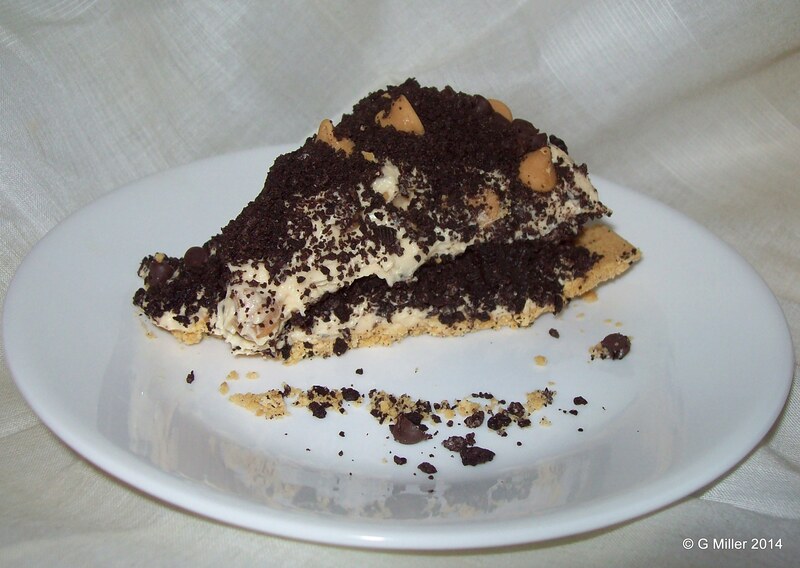 Put the filling into a heap in the center of the pie, then spread it outward over the cookie crumbs. Don’t worry about a perfect edge, Martha Stewart won’t be dropping by before this is all gone, guaranteed! Now, take another 6 Oreo cookies and pulverize them in your blender. Sprinkle them onto the top, spreading them around. (This is also where the not-so-perfect edge, etc. gets hidden.) Sprinkle about 1/4 c. each of the 2 kinds of chips on top of that…cover with the lid, and refrigerate for as long as you can stand it. I will never be a great food stylist or photographer, but believe me, it’s good. Really good. Even if the photo isn’t pretty. This is a fast recipe to make, and a great one for taking to church suppers and potluck dinners because of how easy and fast it is to make. It’s also going to be very popular and you’ll never have leftovers on it! Cream peanut butter and cream cheese together. Slowly add milk, beating on slow. Add instant pudding mix and beat for 30 seconds. Scrape bowl, mounding mixture into center. Beat on high speed for 1 minute. Put half of mixture into center of pie crust and spread to outer edge. Top with 8 crumbled Oreo cookies. Stir 1/2 c. each peanut butter and miniature chocolate chips into remaining half of filling mixture. Mound mixture onto top of cookie crumbs and spread outward towards the edges. Top with remaining crumbled 6 Oreo cookies, along with remaining 1/4 c. each of miniature chocolate chips and peanut butter chips. Chill for at least 1 hour before serving. Best used within 36 hours. This time of year, I’m not enthusiastic about cooking. We still get hungry though. We’re just more inclined to seek cool, no-cooking-required foods. Peanut butter, cheese, tuna, chicken, turkey, and cold cuts are all favorites. We even cooked a turkey breast just to have it for sandwiches & salads last week. This week, on our shopping expedition, we bought something new. Every time we went through the cracker aisle in recent months, my husband would say “mmmm, bacon Ritz” and I would ignore him. I thought he was making some kind of joke. Today, the box got opened. Late last night, my husband had suggested that I had hidden the crackers to keep him from binge eating them. I denied it, but you know how that goes. I was found guilty of hiding the Bacon Ritz crackers anyhow. Today, he hunted them down. They were exactly where I said they were, and in plain sight, but I was already sentenced to grumbling husband despite my innocence. So, with excited fear, we tried them. All bacon lovers know that anything labeled “artificially flavored” and bacon on the same package is usually a recipe for disaster. “Fake-y Bac-y” is not a pleasant taste usually. That’s why the fear level as we slowly moved a cracker towards our mouths, waiting for a sign. I tried hard to not think about recent disasters on flavor tasting fronts, like the horribly vile “chicken and waffle” potato chips I got conned into tasting. (That was so awful that I had to spit them out immediately, without anything more than a nominal effort to chew.) My taste buds were cringing in fear. My taste buds started to party. These crackers are seriously GOOD! We paired them with some cheese and peanut butter (separate crackers, I don’t like cheese and peanut butter together). Still delicious. Good bacon-y flavor without going overboard and tasting more fake-y than bac-y. These crackers are actually going to the top five crackers to have in the house list. They will also be the only flavored cracker to be on the list, which says something about how good they really do taste. Flavored crackers, for us, are usually novelty items that we occasionally may buy, but do not buy regularly. I love it when my taste buds get to party, don’t you? No “fake-y bac-y” arrived, instead, it was delicious! After trying whipped peanut butter with s’mores flavoring recently, and because we’re huge peanut-butter-and-chocolate fans here, we tried Skippy peanut spread with dark chocolate. It sounded great, right? I’ll confess, it was a day or two before we tried it. We were busy, what can I say? Skippy hit the mark with a rich roasted peanut flavor, whether it was peanut spread or butter, but unfortunately, it totally missed the chocolate part of its name, dark or milk or even faintly hot-cocoa-ish in chocolate flavoring. Sure, I liked less sugar and lower fat, but at what cost? It was dark brown chocolate looking paste with no chocolate flavor at all. I was hugely disappointed, and the peanut butter was set aside to make a trip to our granddaughter for a preschool taste test. She had her choice–Jif whipped peanut butter with s’mores or Skippy peanut spread with dark chocolate. She’s 3, okay? She doesn’t care what name is on the container, although after that initial taste test, she knew which one SHE wanted. Sorry, Skippy, not even the three year old liked you better, despite getting served your product first. Without trying the whipped kind. After the whipped kind, she wasn’t willing to even try you again. In the classic words of a three year old who doesn’t know anything about diplomacy yet, she announced it was “poop”. Apparently, dark brown peanut butter looks gross to her, despite her love of chocolate (one of her first multi-syllable words). So, if you are looking for Skippy peanut butter with chocolate, you can read more about it here. Just don’t expect much along the lines of chocolate other than the coloring of the thick paste. And for the record, she was right. It isn’t an attractive color, especially since the only things chocolate about it is its color and the name on the jar. If you’d like to read the review of Jif Whipped Peanut Butter & S’mores, find it right here. 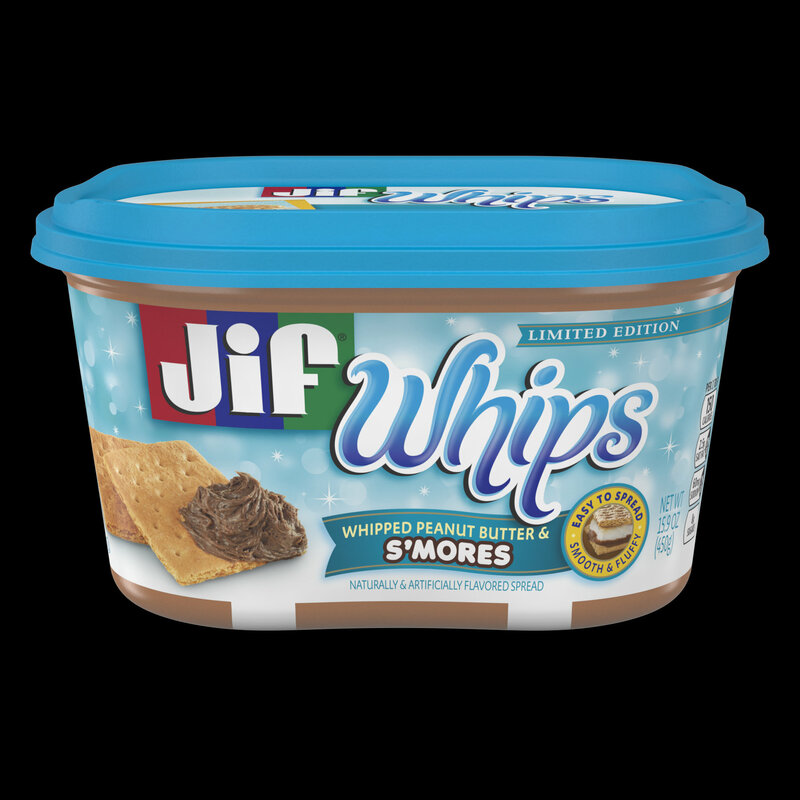 I was recently asked to try & review Jif Whips Whipped Peanut Butter & S’mores. I’ll confess, I had completely missed its debut on the market, and I guess it had been out a while. The whole idea of whipped peanut butter was mystifying, and the idea of s’mores flavored peanut butter was mind boggling. So, the tub of Jif Whipped Peanut Butter & S’mores arrived in due course. It’s a seriously cute package too. So we have to open it, right? Why wait? With my husband as my dutiful (and chocoholic) assistant, the seal is broken and the contents are now accessible. My first taste was via a spoon–I wanted to try it without anything else distorting its flavor. Okay, whipped peanut butter does have a very different texture. Remember how regular peanut butter sort of sticks to the inside of your mouth? It has some serious sticking power too–it was long used to get dogs & horses to look like they were talking for movies and television shows. I’ve used it to dupe innocent dogs into swallowing their pills many times too. Whipped peanut butter has a whole new texture, and it actually feels rather silky in your mouth. I’m one of those people that really can hate something just because of its “mouth feel”, also known as texture. I despise anything that feels greasy or leaves a coating in your mouth too. Right after texture, there is flavor, but then there is always the after-taste effect that can ruin many a great idea that has a poor finish. Whipped peanut butter is silky, but does not have a greasy feel in your mouth. It’s actually kind of fluffy, not dense at all. Then, there’s the appearance. It looks a bit like mousse, I suppose, definitely not the typical peanut butter spread. The s’more flavor is also chocolate-y looking, and it’s really a yummy look. The next thing to come to mind was Nutella. Face it, we’ve all tried it. It’s a great break up food, it’s a great I-got-fired food too. It is also chocolate-y, sweet…and becomes decidedly cloying relatively quickly. How did Jiff Whipped Peanut Butter and S’more fare against this comparison? It isn’t nearly as sweet, which means we can skip the whole cloying sweetness issue. You can taste the chocolate, the peanut butter…and something else, which I blame on the marshmallow & graham crackers in a regular s’more. Somehow, they’ve managed to capture the combination in this smooth, fluffy spread. Yeah, it isn’t peanut butter, but that doesn’t mean it isn’t GOOD! But, that didn’t mean my mind wasn’t working on overdrive! I make a cake to mimic the flavors of a peanut butter cup. The problem there is to get the peanut butter flavor in the filling without it being too dense, as well as not loading a slice with so much fat and so many calories that we have to “save” a week’s worth of indulgence to have one small slice. I can see the Jif Whipped Peanut Butter & S’mores coming into play as a fast solution to filling a cake–it’s got great flavor, and is fluffy enough to spread on a cake. No more trying to whip peanut butter with butter and cream cheese to make a filling! It would also make a great fast frosting for any cupcake or cake, as well as spreading on a muffin. I can see a lot of places that I’d prefer whipped peanut butter over the traditional one in baking. So how does it compare in terms of nutrition and ingredients? I grabbed the containers from the kitchen, and here I have to confess, it’s a generic peanut butter. For the peanut butter, serving size is 2 tbsp., delivering 180 calories, with 140 of those calories coming from fat. That’s 15 grams of fat, 130 mg of sodium, 190 mg of potassium, 8 grams of carbohydrates, and 7 grams of protein in generic peanut butter. It’s ingredients were: peanuts, sugar, hydrogenated vegetable oil, dextrose, salt, molasses, and monoglycerides. Jif Whips Whipped Peanut Butter & S’mores has a 2 tbsp. serving size, with 150 calories per serving, and 100 calories come from fat. Whipped Peanut Butter & S’mores has 11 grams of fat, 60 mg of sodium, 10 grams of carbohydrates, and 3 grams of protein. Apparently, it has negligible amounds of potassium–it wasn’t listed on the panel. The ingredients were more complex, including peanut butter (made from roasted peanuts and sugar with molasses, fully hydrogenated vegetable oils, mono and diglycerides, salt) S’mores flavored spread (sugar, peanut oil, cocoa, with natural and artificial flavors, corn starch, polyglycerol, esters of fatty acids) fully hydrogenated vegetable oils. The suggested retail price for Jif Whips Whipped Peanut Butter & S’mores is $3.49 and has 15.9 oz. per container. It’s also a limited edition, for the month of August. I suppose that’s natural–August is also the traditional month of s’mores as summer winds down through most of America and the calendar is rushing headlong towards Labor Day and the inevitable change of seasons to fall and football. Don’t wait–I know I saw Jif Whips Whipped Peanut Butter & S’mores at Walmart in Hattiesburg, and I am sure that it is gracing grocery shelves throughout the Gulf Coast as well. It’s easy to spread, a delight to eat, and only here for a little while! In my other incarnation, I’m also a radio program host. I interview a lot of authors, but it’s still a rare occasion to have an opportunity to interview the author of a cookbook. On August 12th, I get to do just that when the Nomad Cook will join me to talk about writing her cookbook, Healthy Venezuelan Cooking. You can listen to the program, Gia Scott’s Dawn of Shades, right here from 8-10 p.m. Central on Tuesdays. I’m no expert on the cuisine of Central or South America. I’m also not a Latin American cuisine expert. The closest I come is a strong connection to the cuisine of Southwestern America, with its strong influences from indigenous Americans, as well as a heavy influence of immigrants from Europe and Asia. I know a lot more about Sonoran style cooking than I do about anything further south in its origins. With that said, the recipes and photos in Healthy Venezuelan Cooking were appealing. The cookbook advocates a lighter, healthier style of preparation using healthier ingredients than more modern ones, even if I don’t necessarily agree with some of the ones advocated. (I’m not a fan of canola oil, which is from rapeseeds…and I’ve also done entire programs on GMOs that included a lot of canola seed oil information.) Finding healthier oils is a real problem, and my best solution so far has been to simply use as little as possible, along with a heavy preference for olive oil whenever possible, which is also recommended for use in Healthy Venezuelan Cooking. It also focuses on low gluten and gluten free recipes, which is fantastic for those with celiac disease. With that said, while I really like the cookbook, for those in the Gulf Coast region, there will be one serious problem in making most of the recipes. We don’t have access to many of the ingredients. There are far too few health food stores that carry organic groceries, and farmer’s markets are often our best sources. That means that grass fed or range meats are nearly impossible to get without mail ordering them or raising them ourselves. It also means that we are limited in access to a lot of the other ingredients, from seafood to fruit. Granted, the Gulf Coast has access to fresh seafood galore, but…what is found here is not the same as that available in Venezuela. I’ve never seen octopus or squid sold fresh here. We also don’t see clams or mussels. Then, there are the meats. While I used to live where seeing chevon (goat meat) and mutton (adult sheep meat) were commonly found in grocery stores, it is not common here. My family typically would roast goats in a pit for large family gatherings, and when telling someone about these events, they were horrified. For some reason, they assumed that cooking a goat was some kind of satanic ritual, a connection that still mystifies me. Goat meat is slightly stringy, usually lean, and has a mild flavor that I regard as somewhat similar to that of elk meat. We also always ate either does or males that had been castrated at least 90 days prior to slaughter—I was always told that male goats (bucks) had a strong, unpleasantly gamey flavor if they were not castrated and fed for this period before slaughter, but I can’t swear that this statement is true. Goat meat isn’t the most exotic meat included though. There is a recipe using chiguire, which we know as capybara. For those who are unfamiliar with the animal, it is the world’s largest rodent and is semi-aquatic. I have never seen this for sale anywhere I have lived in the U.S.A. Probably the closest thing available in the Gulf Coast region is the nutria, although since I’ve never eaten either one, I couldn’t swear to it being a good substitute either. They are just similar animals, with the nutria being much smaller and more aquatic in its habits than the capybara is. Even for nutria, to obtain it for cooking would require either hunting it yourself or getting someone else to do it for you—you won’t find it at the farmer’s market! There are a lot of other foods that are completely unfamiliar to me, such as tostones, arepas, and corn flour P.A.N. Other foods, while I have seen them in the grocery store or may have tried them a few times, are still not frequent stars in my own kitchen, such as plantains. Overall, I found the cookbook fascinating, and I particularly like the personal touch of the accompanying stories putting the dishes into the context of life for the writer as anecdotes are shared. This is something that few cookbooks do, but it can bring the foods to life for the reader. While many of the recipes may be difficult to put together as written, with some adaptation, the overall feel of the recipe can be maintained as the style of cooking is adapted to available ingredients. There are also numerous photos showing the dishes, and the directions included with the recipes are clear and easy-to-understand. It is definitely a book that any serious foodie would enjoy, despite the difficulty in creating the dishes in many regions of the USA. Healthy Venezuelan Cooking is currently available as a paperback through Amazon for $26.12 right here. It’s a great idea for a gift for the foodie in your life as well. Everybody likes fast meals, if they are tasty. This one might be a bit different than is commonly found on the Gulf Coast though, as it takes on a lot of Southwestern influence along the way. It starts with the popular and convenient carne picada. For those who are not familiar with it, it’s thinly sliced strips of meat commonly found in the meat coolers. While it’s not top-of-the-line steak, it does work very well with a number of dishes, and this is one of those. This comes together with cans and frozen vegetables to make a fast stew or filling for green chili burritos. I happen to love green chili burritos that are stuffed with the thickened green chili and meat mixture, then covered with red enchilada sauce. For speedy preparation while staying homemade as much as possible, this recipe uses a mixture of canned green enchilada sauce with homemade red enchilada sauce, sparing me from roasting chilies, preparing tomatillos, and slow cooking for an hour or more. In large, heavy skillet, heat 2 tbsp. oil. Add meat and fajita mix, cook, while stirring often until vegetables are tender. Remove from skillet. Heat 3 tbsp. vegetable oil in skillet over medium heat. Add flour, stirring and cooking to make a roux. Cook roux just until it is golden brown. Add enchilada sauce all at once and whisk to create a smooth, thick sauce. Reduce heat to low, and stir in instant beef stock, cumin and oregano. Add meat mixture back into sauce. Cook over low heat for 15-30 minutes, stirring often, until meat is tender. Taste & adjust salt, if necessary. Heat oil in skillet over medium heat. Stir in flour, cumin, oregano, and chili powder. Stirring constantly, cook for 1-2 minutes, ensuring that everything is a smooth paste. Add water, whisking constantly to make a smooth sauce. Reduce heat to low, and simmer for 3-4 minutes, continuing to whisk often. Remove from heat. Taste & adjust salt, if necessary. Keep warm until served. To assemble burritos: Spoon mixture into center of tortillas, folding ends towards the middle over the filling. Starting on one side, fold and roll tortilla around filling to make a neat package. Place burrito on plate and ladle enchilada sauce over burrito to cover entirely. Sprinkle with finely shredded cheese. To duplicate restaurant experience: accompany burrito with about 1 c. finely shredded lettuce, topped with about 2-3 tbsp. of diced tomato. Top lettuce with 1 heaping spoon full of sour cream and about the same amount of prepared guacamole or sliced avocado. Serve salsa on the side. Refried beans and Spanish rice may also accompany burritos.